1. iPave use an external transport company. 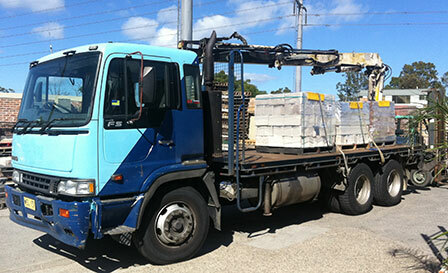 Our transport company delivers to Sydney Metropolitan and surrounds, Central Coast, Newcastle and South Coast areas. iPave also outsource business to deliver Australia wide. 2. All deliveries are made to the Nature Strip / Kerbside only. 3. As we use an external transport company we do not know which truck will be sent. It will either be a crane or forklift truck (see Truck Information section for examples). 4. Should you require a specific truck (crane or forklift) a fee of $110 will be charged. This will ensure the correct truck is sent. 5. If you specify a forklift ($110 fee) we require 3 metres wide and 4 metres high vehicle access. The access road must be relatively flat with no more than 13 degree slopes, for safe operation. 6. The driver will not travel over paved areas. They will also not make deliveries through a neighbouring property, public or private, without the written permission of the property owner. 7. It is the responsibility of the customer to advise of any obstacles the truck driver may face (including, but not limited to, one way access, dead end roads, busy streets, battle axe blocks, grade of slope greater than 13 degrees and any road restrictions. 8. Never organise a delivery for the same day as tradesman starting a job, incase unforeseen circumstances prevent the transport company from delivering on that day. 9. Specific delivery instructions can be made by the customer, in which the transport company will make every effort to accommodate. HOWEVER it shall always be up to the discretion of the driver, we ask that you never question the driver's decision. 1. Lead times on orders will be from 5-10 business days. 2. Customers do not need to be home to receive orders. 3. It is the customers responsibility to advise us of any unique special conditions or requirements for delivery. Unless prior arrangement, all deliveries will be to the Nature Strip / Kerbside only. 4. If the driver determines that he cannot safely off load the goods due to obstacles and/or safety issues relating to the site, the driver shall place the goods in a safe position. 5. If the above mentioned position does not suit the customer, the goods will be returned to the point of dispatch at the customers cost. It is the customers responsibility to provide a suitable and safe vehicular offloading site. Transport costs are the responsibility of the customer. 6. Customers need to provide safe and adequate access to the site and shall pay for any loss or damage to any public or private property. If the driver has any issues relating to site safety, the driver will request the customer sign a disclaimer. 7. Traffic control is required on a main or busy suburban road. It is the customers responsibility to provide appropriate traffic control in accordance with statutory authorities and work cover regulations. 8. The sellers driver shall at all times adhere to local, state, federal and workcover regulations. 1. 24 hours notice is required to cancel a scheduled delivery. 2. Cancellations before the 24 hour period will incur a $132 cancellation fee by the customer. 3. In the event of cancellation within the 24 hour period prior to delivery, a full cartage fee for the delivery will be charged as well as the original fee. iPave uses various courier companies to deliver smaller and lighter products. If you are receiving a product that is to be delivered by a courier you will need to be at the delivery address to sign for the parcel. If you can not be there please contact us for an Authority to Leave form and leave this on your front door or in a place where it will be seen by the driver so that your item can be safely left. If the courier can not leave your item you may incur a redelivery cost. If this should happen all redelivery costs will be the responsibility of the buyer. If you have any questions at all please contact us prior to ordering your item and we will do our best to accommodate your needs where possible.